Crafted from rhythm and reflection, "Arch of Doubt" is a study of angles, edges and lines. Layer upon layer of movement is captured within the work, leaving the viewer with different interpretations each time the piece is viewed. There are a total of 15 pieces of "Arch of Doubt" in the edition. All are numbered. Each is individually signed by Bill Ward. "I love this one. It has a solemness to it that I really like, and I'm drawn to. I call this Arch of Doubt because it feels that way. I think all of us as individuals, every day, we have to pass through some sort of "arch of doubt." If it means passing into a road, making a decision, a lifetime decision about something, or if a friendship is breaking up, we all pass through different arches of doubt. It's gentle, and yet it has an incredible defense system on the outside of it. Going through the arch...it looks soft and okay to walk through it, but there's an outer defense system of barb and of thorns...it is one of my favorites, Arch of Doubt." 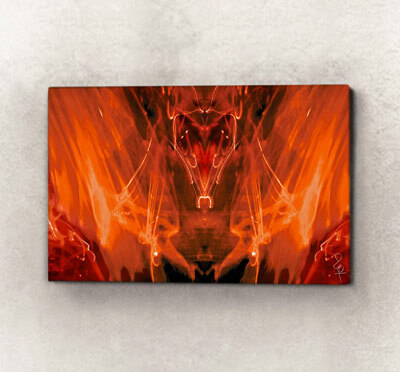 Abstract, yet clearly there are some definitive elements that won’t be ignored within the piece "Cloven Apparition’s Ascent". 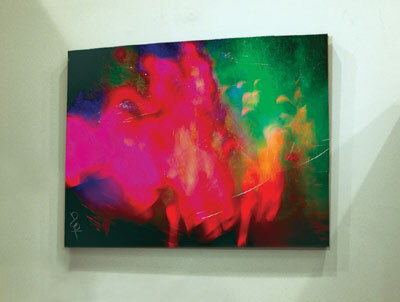 A massive 85” x 30” inches in size, the artwork is a powerful example of rhythm on canvas met with reflection. There are a total of 15 pieces of "Cloven’s Apparition’s Ascent" in the edition. All are numbered. Each is individually signed by Bill Ward. There are a total of 35 pieces of “We Focus. We Persevere.” in the edition. All are numbered. Each is individually signed by Bill Ward. "This is definitely one of my favorites in the collection. I'm smacking the heck out of the drumkit, with lots of energy coming from my heart and lots of finite curvitures and shadows and colors. The title is 'We Focus. We Perservere'. And that is what drumming is to me. Part of drumming is focus...we have to focus. And we perservere...often I make mistakes, but I perservere. I get back up and I try again and I think that is what we have to do...in life itself. I like this piece a lot." Created through an intricate process that combines drum stroke movement and reflection, “Hello, I Don’t Think We’ve Met (Yet)” extends beyond the abstract. Within the image, and depending on how it is studied, several figures appear to the viewer. There are a total of 50 pieces of “Hello, I Don’t Think We’ve Met (Yet)” in the edition. All are numbered. Each is individually signed by Bill Ward. 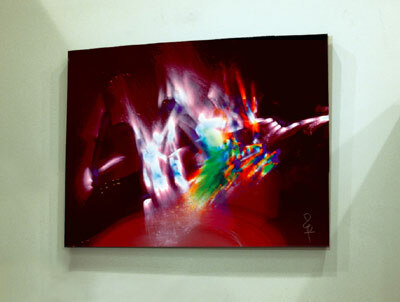 "I'm fascinated by the energy that is coming from this piece. As you can see, we definitely have some things showing up in the visual. I couldn't help but picture this hanging up at the end of a hallway, so every time you're walking toward it, you're going to meet THIS in front of you, hearing the title in your head "Hello, I Don't Think We've Met...Yet." I couldn't resist that. This one is powerful…very powerful." Crafted from a rhythmic pattern on the snare drum, “High on a Memory” showcases one of the richest color pallets in the entire Absence of Corners Collection. 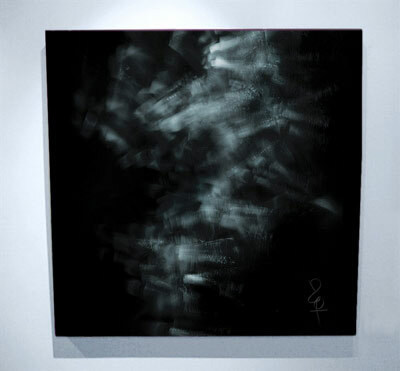 A piece that can be studied both visually and rhythmically, the work explodes onto canvas with power. There are a total of 35 pieces of "High on a Memory" in the edition. All are numbered. Each is individually signed by Bill Ward. I must have been remembering the old days, the happy days, because things have not been that happy the last year of so, but there were very happy times playing with my old band. And there's lots of emotion. There's a whole mass of color, and the color reminded me of a different time. I can remember when I played in the 60's, the 70's, the 80's, the 90's, and the 2000's. And it's like being high on a memory. It's okay to be high on a memory...in a natural way." 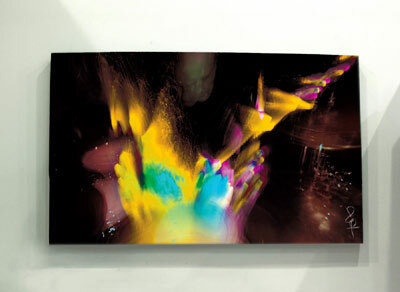 The result of a 60-second performance for canvas, “Indestructible Youth” is a rhythmic study of Ward utilizing the entire kit (from left to right) to build visuals. There are a total of 50 pieces of “Indestructible Youth” in the edition. All are numbered. Each is individually signed by Bill Ward. “Look at the power of some of these sticks... the archs that they are making. So I think it's wonderful from a drumming point of view, where they're totally symmetrical... some of these things. I mean they're absolutely smack on. I call it “Indestructible Youth,” because that's how youth is...it's indestructible, but there's two definite patterns here and it looks like they are trying to connect in some way." One of the most meditative pieces in the collection, “Intuitive Peril” is rich in color and mood. With little finite lines to reference within the piece, the viewer is drawn inward to look beyond the tangible and encouraged to see the infinite. There are a total of 50 pieces of “Intuitive Peril” in the edition. All are numbered. Each is individually signed by Bill Ward. 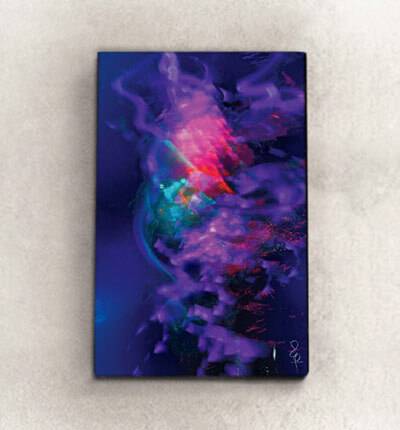 One of the most traditionally abstract pieces in the collection, “Soundshock” is a visually rich study of color and vibration. Built from Ward’s use of the crash cymbal, the piece’s visual is brash and unapologetic in its execution. There are a total of 35 pieces of “Soundshock” in the edition. All are numbered. Each is individually signed by Bill Ward. 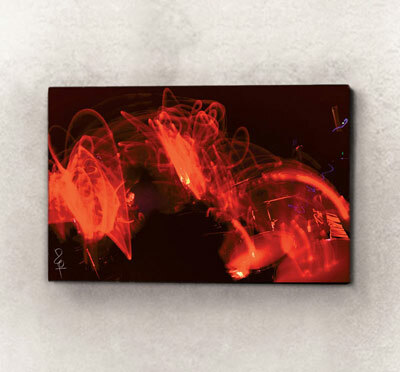 "The huge blur of red in “Soundshock” is the result of some of the drumsticks I chose, lots of different colors and lots of different shades in this piece. As for the title, Soundshock is something that I've been having to deal with for many years because I play in such a loud band and I still play quite loud. I use some of the largest cymbals in the world...they are 26 and 28 inch cymbals and they do leave some damage to my ears. Soundshock is more than simply having ringing in your ears, it effects your perception, the way you listen and view things." 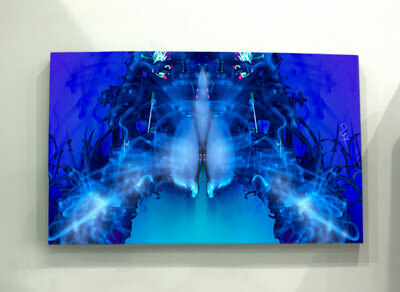 Epic in size, measuring 85” x 30”, “This Evening” is built from rhythm and reflection. The warm glow of Ward’s assorted sticks, met with the faint reflections of the drum kit on either sides of the work, create a visual landscape that is both welcoming and devious. There are a total of 15 pieces of “This Evening” in the edition. All are numbered. Each is individually signed by Bill Ward. "I wanted to call it ‘This Evening’ because I wanted it to focus on right now, so whenever we're coming to 'This Evening', this picture will gain strength and gain all of its evening energy because it's right there now in 'This Evening'. So, I had a lot of fun with it, you know. And it just looks like 'This Evening' and I thought about a nice evening where there is some calm, hopefully, at the end of the day. It's not always like that, there's sometimes there's a lot of chaos at the end of the day." 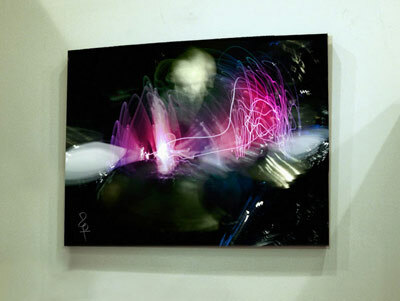 A landscape told through rhythm on canvas, Ward created “Love, Ability, Strength” through a rhythmic performance utilizing of fiber optics sticks and LED technology. The captured light within the work, met with the reflective nature of Ward’s kit, combine in a remarkable way to create the finished work. There are a total of 15 pieces of “Love, Ability, Strength.” All are numbered. Each is individually signed by Bill Ward. "Within it, you'll see my emotional wellbeing coming out of me. I call it ‘Love, Ability, Strength’ and that's a requirement for being able to play drums. I can see my focus. I was really focused. And I know we have that requirement for a lot of other things as well, but it really helps when you are playing drums to have love, ability, and strength." One of the most powerful pieces in the collection, "Grief" served as the first image to represent the upcoming project. From Ward’s rhythm came this remarkable visual. Though abstract, there clearly is a face that comes forward to the viewer. There are a total of 20 pieces of "Grief" in the edition. All are numbered. Each is individually signed by Bill Ward. 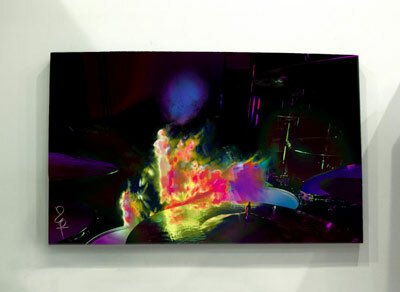 When I first saw the canvas ...just looking at the picture, I was just blown away. I was like 'what the heck was that?' The first thing I thought of was grief. That picture just fit it so well. If one had to pick up all the words and situations and things that have been going on from January 2012 to July 2013, that picture sums it up. It's really become personal to me. I couldn't think of anything more suitable than grief. Just a large portion of my well-being lately has been like that. I think its a great picrture... all the deep crevices in the man's face... the eyes... the nose is very prominent. And it also leaves a little bit for your own imagination, which is beautiful. You can do some thinking for yourself. It's a high impact picture and definitley suits the climate of the last 18 months. The construction of “Fire and Brimstone” was extensive. Beyond the captured rhythm, an intricate reflection process resulted in the visual seen within the work. The result…one of the most sophisticated pieces in the collection. There are a total of 50 pieces of "Fire and Brimstone" in the edition. All are numbered. Each is individually signed by Bill Ward. "It reminds me of fire and brimstone because it is on fire. As a child, fire and brimstone was my first introduction into the darker side. Like as a child, when someone is pretending to be a witch or something. But with the title, I decided to make it completely safe, hence I added the "In My Pocket" to the title. So it's okay…a reminder that I've learned something, not everything by any means, but I've learned a little about fire and brimstone, and I keep it in my pocket." There are a total of 35 pieces of “Making Flowers From My Heart” in the edition. All are numbered. Each is individually signed by Bill Ward. "I love the way the drums show up in this piece. The little things that people never notice, except for other drummers. This piece amazes me, you can see my head, you can see the frame of my body, but when we created this piece, I was in a good place but I was in an emotional kind of upheaval. So I like to think that what we captured in this work is some of the emotions that were coming out of me. The title of this piece is Making Flowers From My Heart. And you can see in the piece, what can be construed as skulls, but also, definitely, multiple flowers that are just pouring out of me and across the drum kit...and this wonderful white light here that is coming from somewhere that just belongs there." Visually triumphant, with colors exploding diagonally, "Nowhere To Belong" is epic in size and impact. 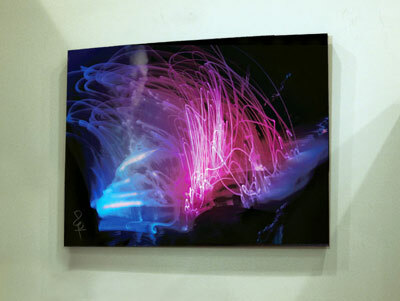 To create, Ward utilized fiber optic brushes as he crafted his rhythm for canvas. The result is a canvas that boasts that will not be ignored. 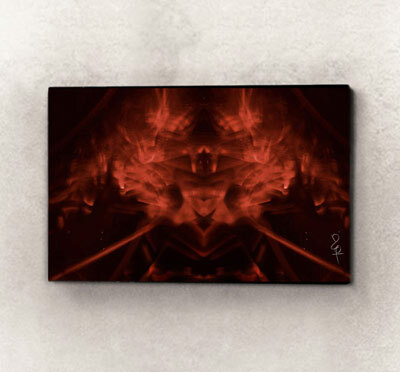 There are a total of 15 canvases of "Nowhere To Belong" available in the edition. All are numbered. Each is individually signed by Bill Ward. "'Nowhere to Belong' is something of an oddity for me because this was a picture, that when it was reviewed, it was always put to one side .. on a high chair or put somewhere else in the room. And we all kind of scratched our heads and quieried and kind of looked at it and went 'Well what do we do about this picture?' So, I came up with the title, 'Nowhere to Belong', and I chose that title because it's something that's close to my heart as well. And perhaps in all of my audio statements in this collection, I think of them as many times as I touch on the same type of things... talking about emotions or different feelings. 'Nowhere to Belong' is a very sad place and the yellow doesn't necessarily represent sad, but it does represent, that it physically had nowhere to belong at some point during the production of these pictures. And I've certainly been there in my heart, over the years. I have a great sense of belonging today, but it wasn't always the case for my life." There are a total of 20 pieces of “Solidarity” in the edition. All are numbered. 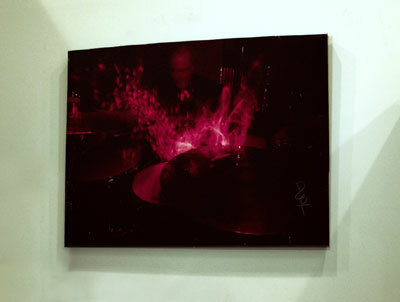 Each is individually signed by Bill Ward. "All I can think here is, 'That's a whole lot of work. My God, what am I doing?' I think its one of those pictures where you can ponder over a cup of tea and enjoy it. The reason why I call it 'Solidarity' is because everything keeps heading the same way and it is all in unison and all heading in one direction. It's like "Yes, we get it, and we're all going this way"... Solidarity."